Posted on 13, July 2017 by EuropaWire PR Editors | This entry was posted in Automotive, France, Technology and tagged autonomous car, Carla Gohin, Groupe PSA. Bookmark the permalink. PARIS, 13-Jul-2017 — /EuropaWire/ — At 10:30 am on Wednesday, on the VINCI Autoroutes motorway network, an autonomous carcrossed a tollgate in a full autonomous mode, for the first time. 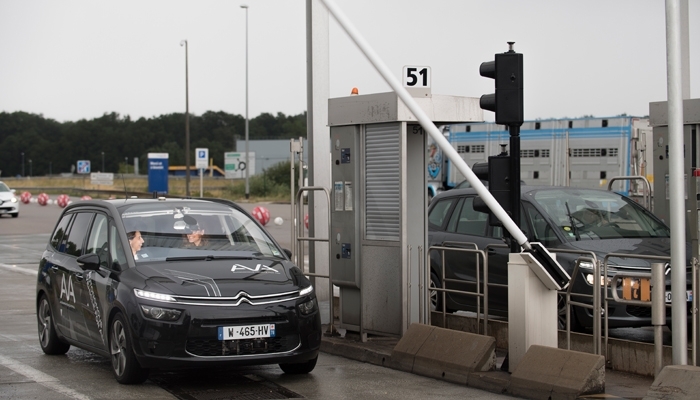 A Citroën C4 Picasso from Groupe PSA’s autonomous vehicles fleet crossed through the toll station at Saint-Arnoult-en-Yvelines (France, Paris area) – the biggest one in Europe – without driver’s assistance thanks to a specific communication between the vehicle and the infrastructure. This test in real traffic conditions shows a significant step forward in the autonomous car development towards the level 4 (“mind off”: without drivers’ supervision). This is the outcome of a development program started in 2016 which seals the collaboration between two major players in the field of mobility: the Groupe PSA, a car manufacturer at the cutting edge of new technologies, and VINCI Autoroutes, the biggest operator of motorway infrastructure in Europe and leader in its own sector in the field of new forms of mobility. A first and significant step has therefore been done in the connection between the autonomous car and the new infrastructures generations needed for its development. Driving through a toll station is a complex issue for an autonomous car. It requires managing the cross flow of vehicles moving randomly through the lanes of the toll station. It also requires guiding the autonomous car in this area where there are no road markings and guiding also the autonomous car along a trajectory which automatically enters the equipped lane which is only three metres wide. Finally, the autonomous car must be in a position to anticipate any unforeseen events that may occur as it crosses through the toll gate. It was essential to set a specific communication protocol between the toll station infrastructure operated by VINCI Autoroutes and the Citroën C4 Picasso, Groupe PSA’s autonomous car. • A guidance system has been deployed 500 metres ahead of the Saint-Arnoult toll (towards Paris direction). This allows the autonomous car to follow a pre-recorded trajectory which guides the car to the toll gate lane that has been selected and equipped. The system indicates the path to follow when exiting the gate until the vehicle reaches the motorway, where the car can start again to steer itself thanks to the white lines. • A pass through permission is sent to the vehicle, indicating whether the gate is open or not. The infrastructure gives the information to the autonomous car using a Road Side Unit (RSU) positioned 300 metres before the toll station at the edge of the motorway, and connected to the toll station system. The RSU uses the ITS G5 protocol, the reference system for the connected vehicles communication to transmit its data. So far, three lanes of the Saint-Arnoult toll station have been permanently fitted with equipment to safely and quickly transmit the permission to pass relayed by the RSU antenna and receive connected and autonomous vehicles such as the Groupe PSA’s autonomous Citroën C4 Picasso vehicle. • The toll station’s information system has also been modified to allow autonomous cars to pass through it. It enables a real-time analysis of the availability of the lane and ensures that the conditions allow the vehicle to safely pass through the gate. The permission thus issued is then sent to the autonomous car by the RSU antenna. • Finally, for this test, the C4 Picasso autonomous vehicle was issued with an electronic toll card enabling it to go through the lanes on autonomous mode. Pierre Coppey, Chairman of VINCI Autoroutes, believes that “mobility is at a crossroads in its history, facing by changing behaviour and user habits that will deeply change the on-road driving and travelling experience. For the vehicles of tomorrow be fully autonomous, they will need to be connected to the smart infrastructures that we are currently inventing. Cooperation between car manufacturers and mobility operators is essential from this point of view. Motorways are safe infrastructures and a wonderful testing ground. Tomorrow, they will be the place of this new mobility deployment”. Carla Gohin, Director of Innovation at Groupe PSA states that “crossing through a tollgate in autonomous mode is an important step towards level 4 autonomous driving on motorways. This experimentation shows the potential provided by real-time communications between the vehicle and the road infrastructure. This is the first step in collaboration with VINCI Autoroutes, the purpose being to assess the contribution made by communications with infrastructure for different situations that the autonomous car may encounter on the motorway, such as early warning of roadworks or to facilitate guiding the vehicle to a rest area. This will be the building blocks that are essential in order to complete the current strategy for the autonomous car development within the Groupe PSA”. – the qualification of traffic conditions for the autonomous driving, and the real-time communication of the vehicle. This is particularly significant to enable the autonomous car to travel safely while taking on board any traffic related information (slow traffic, accidents). This project is consistent with and complementary to other research programs dedicated to the connected and autonomous vehicles, to which both the Groupe PSA and VINCI Autoroutes contribute, such as Scoop@f and C-Roads. In addition, the Groupe PSA and VINCI Autoroutes also play an active role in standardisation and knowledge sharing projects, especially through the VEDECOM institute.